Modeled similar to project fairs, the Multi-Club Workshop (MCW) is an annual event where international Rotarians, relatives and friends meet to promote the implementation of international humanitarian projects. Hosted in a different city every year, the first few days of the workshop are dedicated to planning international humanitarian initiatives while the rest of the event focuses on cultural immersion, site seeing, and building fellowship. The 9th MCW will be hosted in St. Petersburg, Russia, from 2 to 9 September. An optional group trip to Moscow will follow the workshop. During times of tension between the West and the East, we hope meeting in Russia will help us continue to serve as catalysts for advancing peace, strengthening international relationships, and promoting good will. Through this event, we hope to bring better understanding and friendship between two parts of the world that are pivotal to global advancement within our six areas of focus. Join us for this life-changing experience that will build relationships across country lines resulting in better humanitarian projects and greater global awareness and understanding. 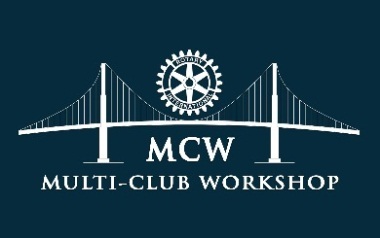 Since the first Multi-Club Workshop was hosted in Stockholm, Sweden, in September 2007 , many Rotarians and their partners and friends from around Europe have met in Bari, Riga, Ravenna, Malmö, Manfredonia, Belgrade and Ischia. Between the eight previous workshops, we have welcomed 516 participants, 188 clubs, and 66 districts to our community. Together we have improved the lives of thousands of people. We hope you join us in September.